The Parliament will meet for the Budget session from today till February 13 with the interim budget to be presented on February 1. President Ram Nath Kovind on Thursday addressed the joint sitting of both the Houses of Parliament for the Budget session with the interim budget to be presented on February 1. The Parliament will meet from today till February 13. The session will have 10 sittings. This will be the last session of the 16th Lok Sabha as the elections are likely to be held in April-May. Addressing a joint sitting of the Lok Sabha and the Rajya Sabha, President Kovind lauded the present Government for taking up the initiative to form a ‘New India’, adding that the country was going through a phase of uncertainty before the 2014 elections. 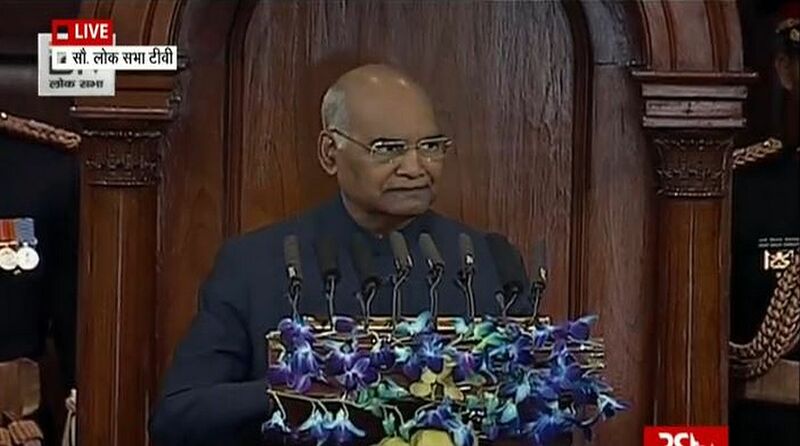 “My government has taken a pledge for a ‘New India’, an India where nobody remains hungry, an India where everyone gets basic healthcare and education,” President Kovind said. He said he was happy that the benefits of government schemes were reaching the masses as was aimed from the beginning. The President said the basic needs of the poor was fulfilled by the BJP government, from healthcare to sanitation, education to cooking gas, among others, adding that the direct benefit transfers were also reaching the poor without any pilferage. The President further said that the main mission of his Government was to make the life of every citizen better. President Kovind also praised the Government’s Ujjwala scheme and the Ayushman Bharat Yojana. He said, under the Ujjwala scheme, more than 6 crore gas connections have been given so far. “After decades of effort, there were only 12 million gas connections in our country till the year 2014. In only four and a half years, my government has added a total of 13 crore households to the gas connection,” he added. Speaking on the ‘mass drug project’ the President said, 4,900 drug centres have been opened in more than 600 districts across the country, adding that medicines are being provided at more than 700 centres at a very low cost. Applauding PM Modi’s ‘safety insurance plan’, he said the scheme has granted to nearly 21 crore poor siblings insurance safety shields. He said his Government has a sensitive approach towards injustices prevalent in the society, claiming that it has attempted a proper transformation in the law system for social and economic justice. On the educational front, the President said the BJP Government is setting up new educational institutions and setting up 7 IIT, 7 IIM, 14 IIIT’s, 1 NIT and 4 NID to enhance the opportunities for high-level professional education. Speaking on farm issues, President Kovind said the Government was trying to double the income of the farmers. He said the priority of the Government was to assist the farmers in the whole process of buying agricultural equipment and seeds from the market and to deliver and sell agricultural products. Lauding Government’s efforts to check black money, the President said different schemes were introduced to evade black money from India and abroad. Taxes were imposed on various ways of earning and incomes, he said. The president also hailed the ‘Jan Dhan Yojana’, where he claimed that 34 crore people have opened a bank account and almost every family in the country is connected to the banking system. “The expansion of ‘direct benefit transfer’ has reached over Rs 6 lakh crores of rupees to beneficiaries in the past four years. Because of this, about 1 lakh to 10 thousand crores of rupees are saved in the wrong hands,” he added. The President also hailed the Goods and Services Tax (GST) saying that it is a long-term policy and a boon for the business sector. On the ‘Make In India’ programme, the President informed that India has become the world’s 2nd largest manufacturer of mobile phones. Earlier on Thursday, Prime Minister Narendra Modi urged the Opposition to take an active part in the budget session of the Parliament.